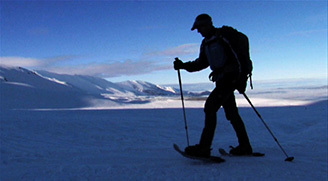 Enjoy snowy mountains on nordic skis or snowshoes! You don't have to be a skier to have fun up in the snow. Hike just 3 hours to a hut in the snow and explore the winter wilderness from a cosy base. Ski touring in the Two Thumb Range. Inside Rex Simpson Hut, the perfect base for backcountry skiing and snowshoeing. Views for forever, snow all to ourselves, perfect touring! There's nothing more refreshing than getting away into the hills, even if only for 2-3 days. Some physical exertion combined with being looked after and being able to relax in a cosy mountain hut is guaranteed to re-charge the batteries, giving you renewed energy to contend with whatever challenges life throws at you! Lake Tekapo, in the South Island's mountain heartland, is an ideal winter retreat, offering everything from a choice of ski areas to ice skating rink, spa pools, star gazing tours and scenic flights. However, for those wanting to "get away from it all" there's more. The Two Thumb Range above Lake Tekapo, in the newly-created Kahui Kaupeka Conservation Park, provides a perfect playground for ski touring and snowshoeing. Soothing for the nerves! Laying your own tracks through the smooth snow, far from crowds and noise on "Snake Ridge", Two Thumb Range, Lake Tekapo. Up here in the foothills of the Southern Alps the landscape undergoes a magic transformation in winter. A covering of snow turns these tawny tussock lands into a winter wonderland of ice-covered streams, curving ridges and snowy valleys. All you need to do is hike three hours up to a cosy mountain hut at the snowline (1280m) and use this as a base to have fun exploring the surrounds on skis or snowshoes. Even before you reach the hut you have sweeping views across the Mackenzie Basin. Beyond the hut just climb a bit further along "Snake Ridge" to view the major peaks of the Main Divide, Mounts Cook and Tasman. Three days is an optimum time for sampling snowshoeing, or nordic skiing, but for those limited to weekends two days will certainly give a refreshing break; and there are plenty of trail options for those who are able to spend 5 days. No previous experience with snowshoeing or with cross-country skiing is required, but good stamina and tramping fitness are essential. 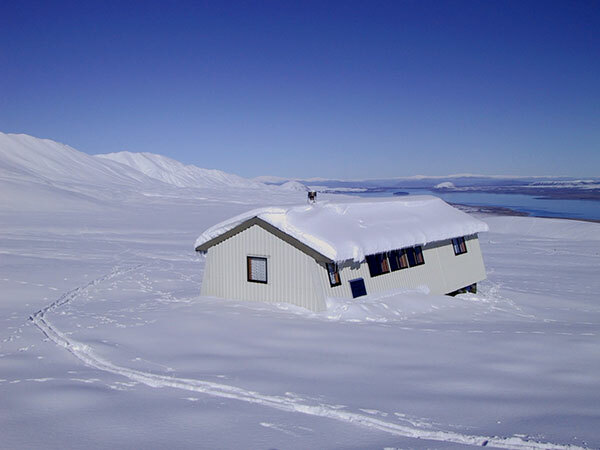 Rex Simpson Hut, high above Lake Tekapo, provides a warm, cosy base for winter tours. A Lake Tekapo-based mountain guiding company, Alpine Recreation, has the ideal base for these activities: a private hut above the snowline. The hut has a wood-fired pot belly stove and their fully-guided packages include everything from sleeping bags at the hut and all other equipment to all meals cooked for you by the guide. View www.alpinerecreation.com/ski for more details, or ring 0800 006 096. "Nordic skiing in this area has been the winter recreation of choice for New Zealand's former Prime Minister, Helen Clark, for many years and continues to be so, even after her taking on the demanding role of heading the United Nations Development Programme in New York."